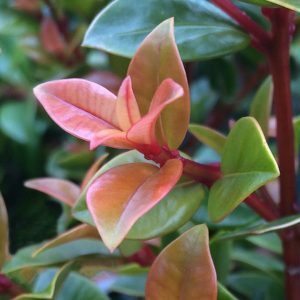 With attractive foliage Syzygium australe are widely used as hedging plants, glossy leaves, with good bronze to red colour on new growth before turning to a mid to deep green. Originally from Queensland, it is mainly the cultivars that range from small shrubs to large trees that are used in landscaping. Also suited for use as background plants in the boarder, as well as for topiary, you can choose from compact varieties to larger hedging or windbreak plants. Syzygium australe varieties are valued for what is regarded as a non invasive root system and making a great hedging plant. S. australe ‘Resilience’ – better resistance to Psyllids than most. Reaches around 4m in height. S. australe ‘Orange Twist’ – Bright new orange growth on a plant that will be best at around 3m. Masses of white flowers in spring, followed by trademark purple berries. S. australe ‘Bush Christmas’ is reasonably compact and will reach 3m. ‘Aussie Southern’ will get to 4m as will ‘Big Red’. S. australe ‘Hinterland Gold’ – Larger growing to around 6m in height, golden coppery new growth in spring. S. australe ‘Pinnacle’ – A more upright growth habit as the name suggests, a narrow growing cultivar, excellent for hedges. It will reach around 6m in height with a narrow spread to 3m depending on conditions. S. australe ‘Opal Maze’ – Another compact form to around 3m in height. Nice rounded growth habit. Smaller foliage lends itself more readily to pruning than some others. 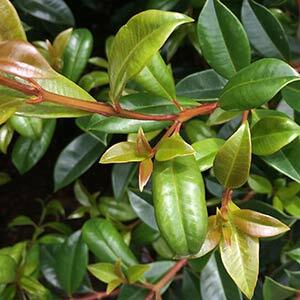 Hedging plant or for screening around dining and outdoor entertaining areas. Background plant in the garden border or as a windbreak. Choose a humus rich fertile soil and dig in some well rotted compost before planting. Prepare the planting hole by making it twice the size of the container. Position a stake if required. Once established these are a very low maintenance plant requiring little attention except for pruning as required. A well drained humus rich soil and a sunny position will provide best growth rate. Syzygium australe are available for sale from the following nurseries.